· Go straight down until you get to the triangle next to the park from there turn left. · Keep going until you reach the 7 Oaks Park. · From there continue going until you reach the underpass. · Go up the ramp and turn left when you reach the telephone boxes go right. 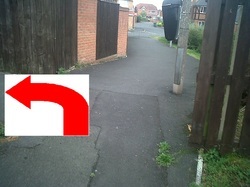 · Now go left down by the bike sheds then right down past all of the shops. · Follow the path around across the road and you will reach the phoenix pub. · Now turn right up towards then left, then turn right going thrown the ramp leading to Concordia. 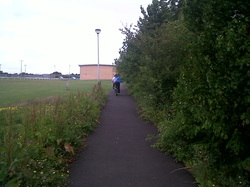 · Turn left and go until the car park begins there should be a pathway leading across to Asda. · Turn left and follow the path all the way down under the under-pass. OPTIONAL STOP FOR FOOD AND TOILETS. · Cut across the gravel through the bushes to McDonalds. · After that come back through the bushes that you came through. IF NOT JUST CARRY ON HERE. · On your left there is a long downhill path which leads to the underpass, go down this path. · Continue under the high bridge and on your left there is a ramp which leads you over the top of the bridge. · Go over the bridge and continue down the path and take the first left. 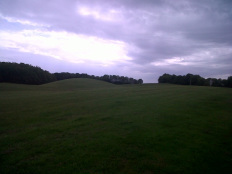 · As you go down this path there is a large field area very suitable for games or a picnic. OPTION TO STOP AT THE PARK. · Next turn right and keep following the path until you reach the park on your right hand side. · If you want to visit the childrens park follow the path to the right until you reach the entrance. · You will reach a junction you will get the option to go left or straight on, make sure you go straight on and watch out for the bridge. · After that you continue to follow the path until you reach a quiet road. · Turn left at this point and follow the road, you will see a building site eventually on your right. Be careful going over the train tracks and wait till its clear! · You should reach a level crossing, go straight over avoiding traffic. · Continue down the path until you see a slight lay by, go through the lay by and over the grass. · There will be a cut into an estate, go straight down and turn right at the first exit. · Follow onwards and go over the Bridge and follow the road down. · You have the option to go left or right, go left only for a little bit, because on the opposite side of the road there is a little cut through some houses. · Go down the cut through the houses. · Keep going down until there is an option to go left, go down and follow that pathway. · If you follow that path around the corner, you have reached your destination, the sporting club! When you are going down arcot lane you turn a corner and there is a small bridge over a stream, part of the bridge has collapsed and there is a small ditch filled with bricks and rocks, be carefull not to go fast around the corners so that you won't end up falling off your bike and into the stream. The route on a map.